If you haven't yet heard of Aromatherapy Associates, now's your chance. I'm obsessed with everything in the line (like this lip balm, for example) -- but the candles are out of this world. If you only give one gift this season, please make it one of these two candle sets. 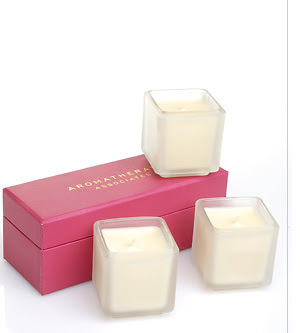 Aromatherapy Associates Rose & Ginger Candle Trio ($56 at spalook.com): This set appeals to the girly side in me. I usually don't like pink, but there's something about the way these three candles are packaged that just really calls to me. The combination of rose and ginger creates a light, delicate fragrance that permeates without feeling heavy or cloying -- perfect for a cold winter's night cuddled up under a blanket with a book or episode of The Vampire Diaries. Aromatherapy Associates Essential Candles: Perfect for the overachiever who just needs a bit of downtime, this set of three candles works to calm. There's Relax (with bay and lavender), De-stress (with chamomile) and Revive (with pink grapefruit and petitgrain). You'll actually look forward to crazy workdays, just so you have a chance to burn one of these when you get home! Note: This set is no longer available. Best of all, each candle from both of these sets has a 20-hour burn time, so you're sure to give -- or get -- plenty of lusciously wonderful scents in the home for days and days on end.